We also have to gauge the importance of factors such as the leaving group and temperature. This is often one of the most difficult parts of organic chemistry for new students: how to weigh multiple (and often contradictory) factors? How do we know which factor is most important? Do we pay attention to the base, substrate, temperature, solvent? How do we go about sorting through a problem like this? As I’ve written before, deciding SN1/SN2/E1/E2 is not completely unlike how a professional bettor might evaluate which sports team is going to win on a given night (does good defence beat good offence? how important is coaching? how important is their recent performance? ) . It’s also an approach where I tend to (at least in the beginning) ruling things out rather than ruling things “in”. In other words, seek to decide what options are not possible, rather than decide which are possible. It’s a subtle distinction, but a valuable one. Once you’ve crossed certain reactions off the list, you can then start asking yourself which reactions would be most consistent with the reaction conditions. Before getting specific with each of those 4 questions, let’s start with the most important question you can ask in any situation like the ones above. The most important step in evaluating any reaction is first to ask yourself “what type of functional group(s) are present in this molecule? This is because the type of functional group will dictate the type of reaction(s) that can occur. Note that in the questions above, all of the starting materials are alkyl halides or alcohols. Substitution/elimination reactions are possible for these substrates; many other reaction types (addition, for example) are not. Given that we’re looking at alkyl halides/alcohols, it’s a reasonable expectation that we should evaluate SN1/SN2/E1/E2. The next step is to identify the type of alkyl halide we are dealing with. Look at the carbon that contains the best leaving group. Typically this is Cl, Br, I or some other group that can act as a good leaving group. Ask yourself: is this carbon primary, secondary, or tertiary? The “big barrier” to the SN1 and E1 reactions is carbocation stability. The rate of SN1 and E1 reactions proceeds in the order tertiary > secondary > primary. So how can we apply what we know about each of these reactions to simplify our decision? Quick N’ Dirty Rule #1: If the substrate is primary, we can rule out SN1 and E1, because primary carbocations are unstable* (see below for exceptions). You cannot definitively rule out E2 yet, although I will spill the beans and say that it’s almost certainly going to be SN2 unless you are using a very sterically hindered (“bulky”) base such as tert-butoxide ion (e.g. potassium t-butoxide KOtBu). Quick N’ Dirty Rule #2: If the substrate is tertiary, we can rule out SN2, because tertiary carbons are very sterically hindered. If the substrate is secondary, we can’t rule out anything (yet). As you can see, based on the information we’ve evaluated so far, we can’t make a definitive decision on SN1/SN2/E1/E2. We’ll have to look at some other factors before we can make a final decision. Next, we’ll evaluate the role of the nucleophile/base. NOTES: One final word of warning on the substrate: SN1/SN2/E1/E2 reactions tend not to occur on alkenyl or alkynyl halides. So if you see one of the substrates below, it is highly likely that no reaction will occur. Why are alkenyl and alkynyl halides so bad? Well, the SN1, SN2, and E1 mechanisms all involve considerable build-up of positive charge on the carbon bearing the leaving group, and the stability of sp2 and sp hybridized carbocations is much lower than that for sp3 hybridized carbocations [for the same reason that sp and sp2 anions are more stable than sp3 carbanions!]. * One question that comes up a lot is this: are there exceptions? Keeping in mind the two themes of “steric hindrance” and “carbocation stability”, there are edge cases where we can have a particularly sterically hindered primary alkyl halide, or a particularly stable primary carbocation. For instance, the alkyl halide below (“neopentyl bromide”) is indeed primary, but is so crowded on the carbon adjacent to the primary alkyl halide that it is essentially inert in SN2 reactions. On the SN1/E1 side, the allyl halide below, while primary, can undergo SN1/E1 reactions because the resulting carbocation is stabilized through resonance. As long as you keep in mind the “big barriers” for each reaction, you should be fine. what are the products formed in the above given reactions? sorry! i got the answer after going through part 2,3,4..
How can you tell when a compound is stabilized by resonance, and it only important in Sn1 or E1 reaction mechanisms and not the other two? The compound is stabilized by resonance if the formation of resonance structures is possible on the carbocation. This only matters in SN1 and E1 because those are the only two reactions where carbocations are formed. For example look at the isoprenyl bromide he has drawn above. If you remove the Br leaving group you’re left with a positive charge on the carbon it was previously attached to. If you move the double bond over to the right, making a resonance structure, the positive charge is now on a tertiary carbon, making it a more stable carbocation. If the reaction is SN2 or E2 don’t worry about resonance because its all happening in one step and no carbocation is formed. Simple: look for π-conjugated systems. Resonance is possible in those structures. So for the exception, primary carbocations are possible if they are allylic or benzylic…cuz resonance? In the example of bromopropane, why can we not consider carbocation rearrangement? In “real life” SN2 pathways are more favourable but textbook/exam questions do not always represent real life. Often cases with secondary alkyl halides are opportunities for instructors to test rearrangements, etc. That’s why it’s important to be aware of these types of situations. You’re right though – it can be instructor dependent. hi , is it possible for SN2 to occur at a primary alcohol ? i know that a primary carbocation is unstable , but what if a methyl/hydride shift is possible ? and it’ll form a secondary carbocation which is more stable than a primary carbocation ? Yes, you’d have to protonate the alcohol to give the conjugate acid, and then the leaving group would be water. One example is the brute force formation of diethyl ether from heating ethanol with acid. Thank you this was so helpful !! Make sure to check posts 2 and 3 everyone. If a reaction is SN1 is it automatically E1 as well? Not automatically, but E1 reactions can accompany SN1 reactions. Sometimes E1 reactions are simply not possible, such as in the case of benzyl bromide in water for example. I dont understand something, and nowhere does anyone bother to explain it. when there is a primary carbocation, and it can go through rearrangement why won’t it? and then you cant rule out Sn1. like the example of cyclohexane ring, to which is connected CH2Cl it would be primary at first but with rearrangement it can become a teritary which is very stable….so what would happen? The cyclohexane ring would not rearrange because of how stable the ring itself is. Thank you for an incredibly valuable resource! 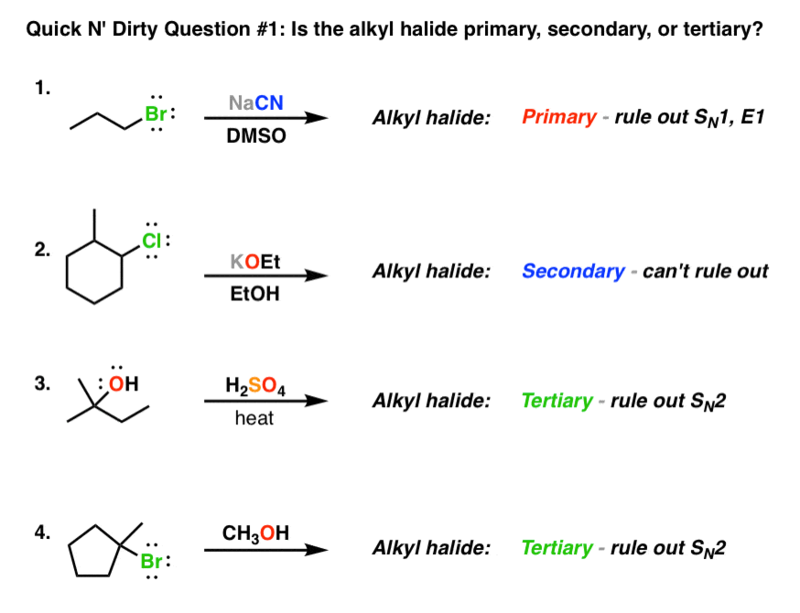 Is there a chance that a primary alkyl halide undergoes a SN1 reaction? Yesterday at uni I was given this example: Hydrolisis of (Bromomethyl)cyclopentane. Primary allylic, yes. Primary alkyl halide, formation of the primary carbocation as an intermediate is unlikely. It’s possible to have concerted rearrangement reactions where migration of a neighboring group accompanies displacement of a leaving group, which is generally how these types of things happen. Hi James, at the bottom of your post you wrote “For instance, the alkyl halide below (“neopentyl chloride”) is indeed primary…” but the image shows neopentyl bromide. Just FYI. Oh yeah, thanks Jessica. Fixed! what happens if there is one factor that favors Sn1 but another factor that favors Sn2. Like what if it’s a primary substrate with a weak nucleophile, or a tertiary substrate in a polar aprotic solvent? Well, these are the kinds of things that you have to weigh when evaluating these questions. Read on to parts 2 and 3. In the note section, can it also be explained by partial double bond character on the halogen in vinyl and aryl halide? The halogen would not have significant pi bond character. The answer is that the resulting carbocations would be very unstable. So for the exception, primary carbocations are possible if they are allylic or benzylic…cuz resonance? thanks for sharing such informative article. Yes, the positive charge in the empty p-orbital on the primary carbocation can be delocalized through the larger pi-system. 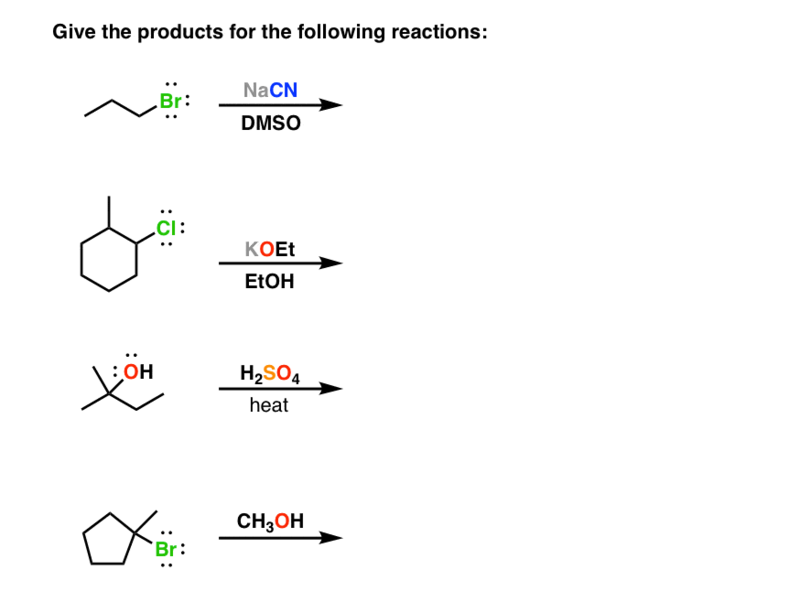 what are the products formed in the above-given reactions? You’ll have to go forward in the Quick N’ Dirty Guide to find out.